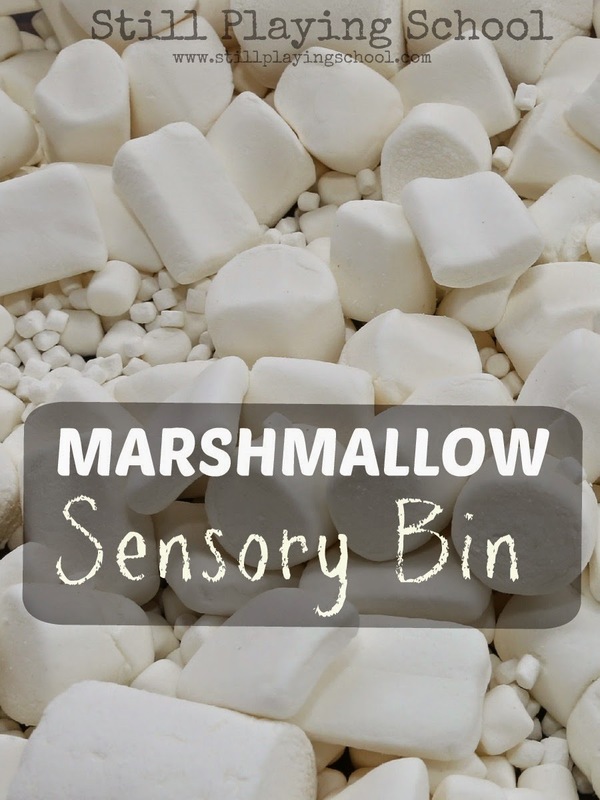 After our invitation to build with marshmallows we dumped all the different types and sizes of marshmallows into a bin for sensory exploration! 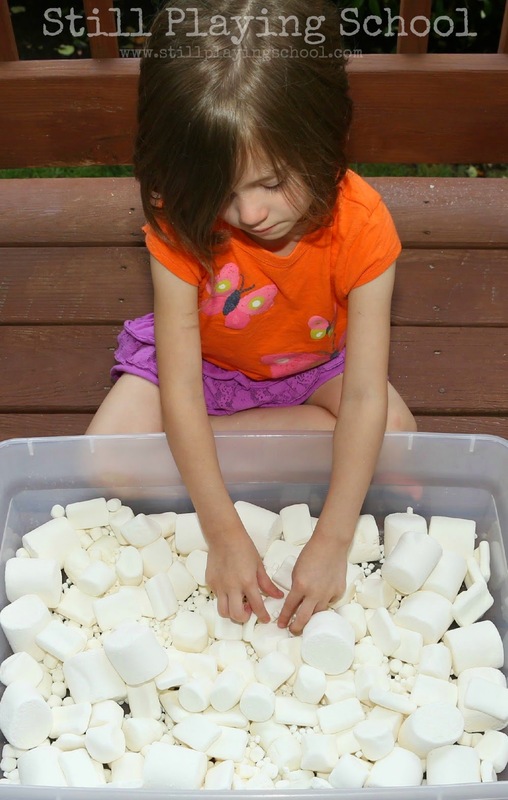 We created a marshmallow sensory bin for our preschooler and toddler. Our sensory bin was full of jumbo, regular, flat, mini, and tiny marshmallows. Our preschooler E jumped right in to play! Toddler D seems to be over his reluctance to sensory play! 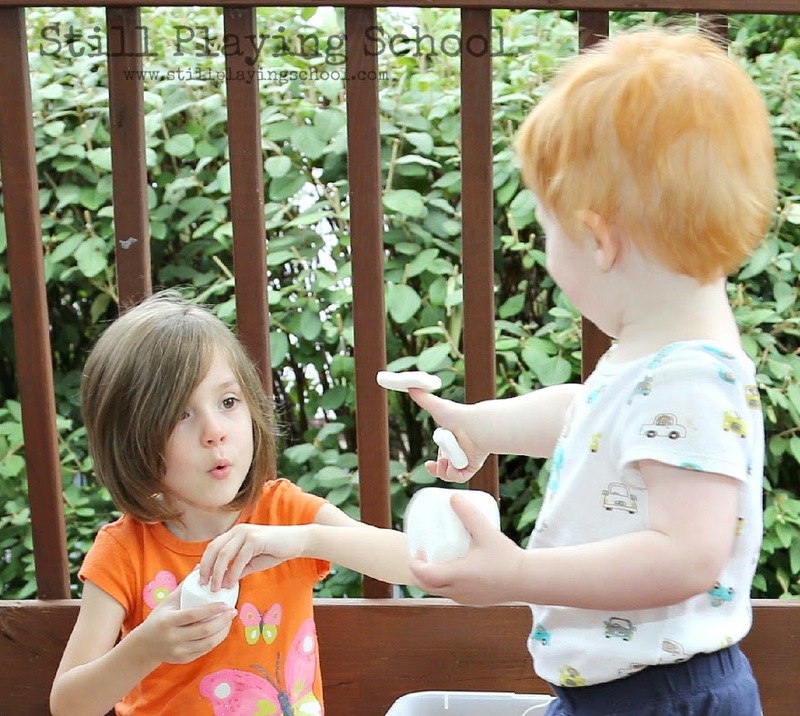 He stuck his hands right into the bin and showed one of his discoveries to E. I love this photo of her reaction! He rubbed the soft marshmallows on his face. It sounds like this bin was a sticky mess but it really wasn't. The powder on the outside of the marshmallows prevented sticking. We easily wiped off hands when we went inside. E found marshmallows that matched as we discussed alike and different. She sorted by size. And yes, she tasted one! Ever time we do an activity with food readers comment how their children would eat it all. Our daughter usually asks in the beginning if she can eat some and I explain that she can pick one when we're done. Soon they are so involved in their play they forget to snack but I love that the bin contents are edible if you do have a mouthing toddler! I love this picture, too! 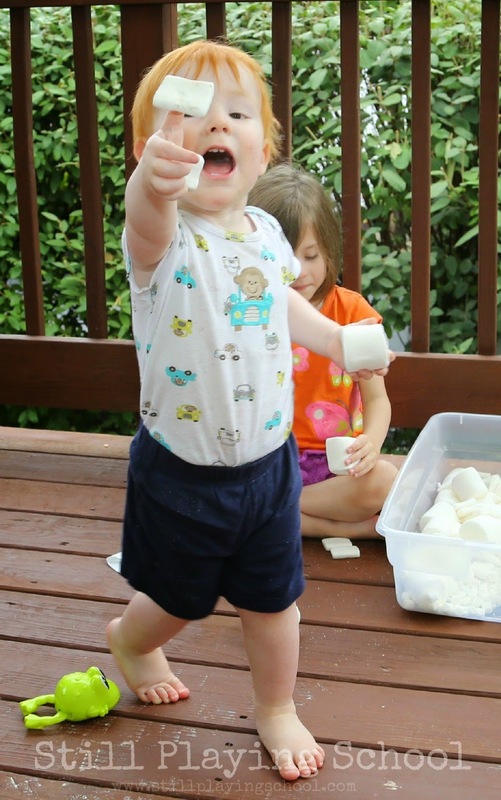 D is so excited to show you the marshmallow that is stuck in his thumb. This bin inspired a lot of fine motor work! 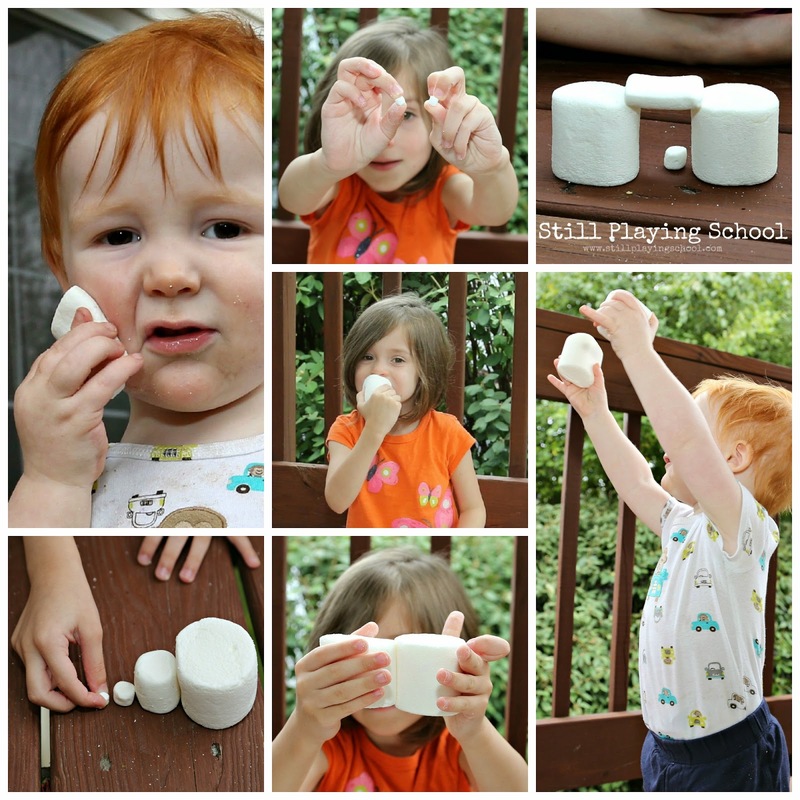 E showed D what she learned during her exploration in marshmallow construction. 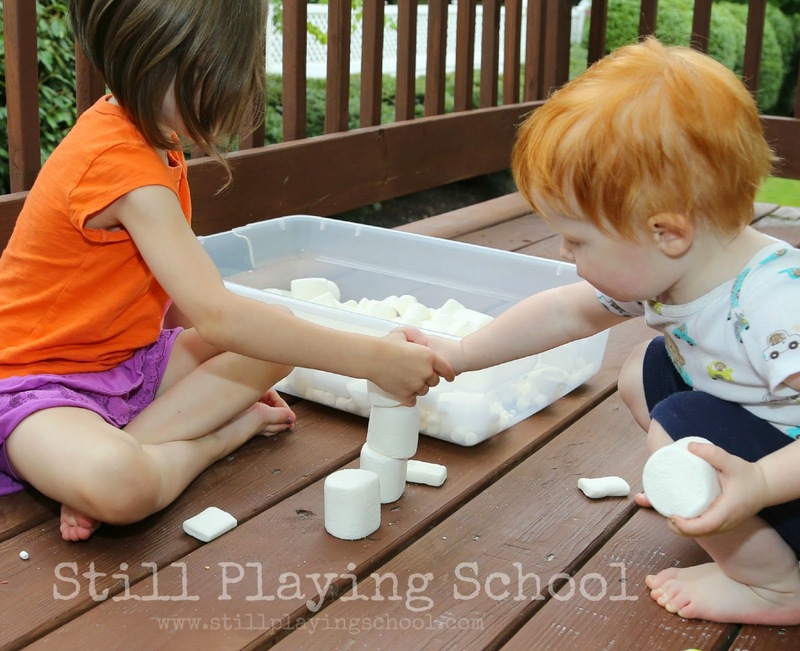 The cooperation as they stacked the large marshmallows was heartwarming to witness!